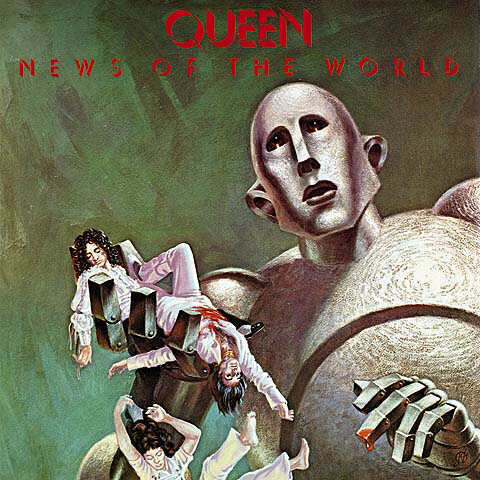 News of the World is one of those orphaned classic rock albums that features one hit that everyone, and I mean EVERYONE knows, and then a bunch of forgotten tunes that will never hear the light of day for most listeners - even those who would confess being fans of the artist. With this album, Queen treads water within a rapidly transforming musical landscape, producing a familiar blend of hard rock and homages to vintage styles of music that inspired them as young musicians. The rock songs on the album are mixed bag. The big ones, "We Will Rock You" and "We Are the Champions" use massive hooks to and even more massive vocals to make them all-time standouts. They're simple, epic, memorable, and uplifting... and not very progressive. The other upbeat tunes on this album are a mixed bag. "Sheer Heart Attack" is schizophrenic, punk-rock like, and an experiment that doesn't really work for the band. On the other hand, "Spread Your Wings" and "It's Late" a impressive and rousing ballads that actually pretty good, being forgotten Queen classics. "It's Late" especially has a great rock feel, sultry Vocals by Mercury, and exciting tempo shifts. How did this one not make it in to a Greatest Hits collection? "Fight From the Inside" is another hidden gem. It's got Taylor taking the lead with a huge bass groove that crushes the listener with feedback fuzz and Deacon's great vocals. Deacon in general is an under rated vocalist; if he weren't in a band with Freddie Mercury, he would easily be remembered as a strong voice in the genre. Many of the other songs feel like homages or experiments that don't always work. "All Dead" has interesting piano textures, but doesn't stick with me. "Get Down Make Love" is another misfire, "Sleeping on the Sidewalk" is vintage blues that May's guitar and voice doesn't do justice. Meanwhile "Who Needs You" is a Latin pastiche with nice vocal harmonies, but not much else. These songs aren't bad, but are not mentioned when we talk about Queen for a reason. News of the World will remembered for it's two opening tracks, and for fans of the band's stronger works it's still a worthy purchase for great songs like "It's Late." Bumped up to 3-stars, because even Queen on the mediocre side is still great fun and the good parts are legitimately good.